On the morning of February 26 2019, the Acting Governor Arnold I. Palacios touched base with the Oceania Customs Organisation Secretariat. Acting Governor Palacios met with Roy Lagolago, Head of Secretariat and Kalei Billings-Dugu, Human Resource & Logistics Coordinator. 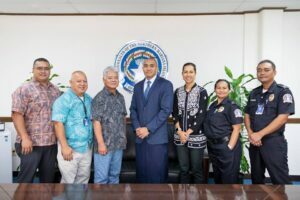 Director of Revenue and Taxation Dave Atalig, CNMI Div of Customs Service Director Joe Mafnas, Planner and 2019 Conference Chair Reina Camacho and Captain Marvin Sablan were also present. Director Mafnas and Head of Secretariat Lagolago, with H.R. & Logistics Coordinator Billings-Dugu discussed the upcoming 2019 Oceania Customs Organisation Conference. The OCO Secretariat is the implementing agency for the EU-EDF10 Trade Facilitation in Customs Cooperation Project aimed at modernizing and standardizing the customs systems and procedures within the Region. The mission of the OCO is to help administrations align with customs international standards and best practices, leading to greater economic prosperity and increased border security. There are 24 OCO members which include Palau, Guam, Kiribati, American Samoa, French Polynesia, Cook Islands, Tuvalu, Samoa, Tonga, Niue, Fiji, Wallis and Futuna, Vanuatu, Nauru, Marshall Islands, FSM, Papua New Guinea, Timor Leste, Australia, Norfolk Islands, New Caledonia, Solomon Islands, New Zealand and the Northern Mariana Islands.